Western Hunan Zhangjiajie China International Travel Service Co., Ltd is the professional travel agencies with having first issued the international travel agency business license which is approved by the national tourism administration (license number: L-HUN-08017). It is only a comprehensive tourism enterprise under the representational and good bureau which is established in Zhangjiajie city by the tourism bureau of Hunan province. It is founded in early 80s with many years’ wealth experience and strength of organizing and recepting guests at home and abroad. A it always has maintained a first-class service standards and good reputation. In our company There are 315 of which is 182 Chinese tour guide, English tour guide 16 and Korean tour guide 52 people. College degree or above accounted for 90%. The annual reception of Chinese and foreign tourists is more than 100 thousand people, of which includes 30 thousand foreign tourists. 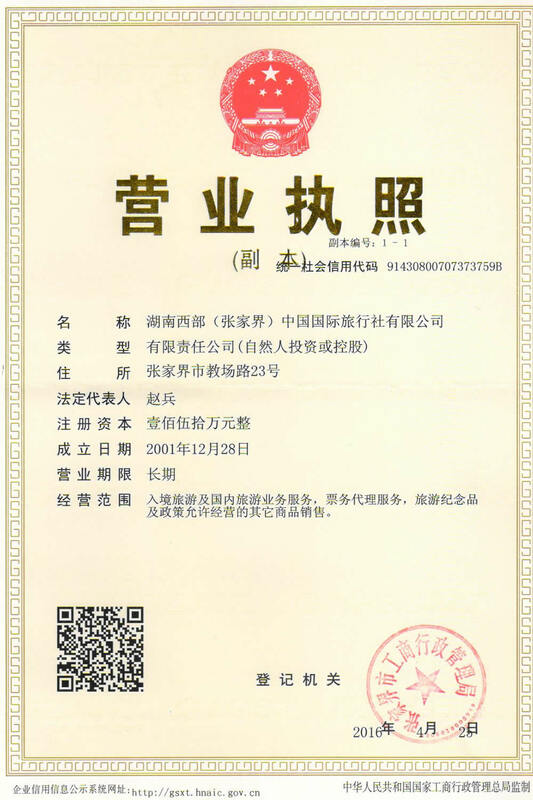 Our company has repeatedly awarded all kinds of honors and recognitions from Zhangjiajie municipal tourism bureau and Hunan provincial tourism Bureau. It has a good social impact. “Honesty is the root of all resources; trust is the first of all things”. Western Hunan Zhangjiajie China International Travel Service is always willing to regard the honesty as the company’s foothold under the foundation of excellent service and good faith is gold. In good faith to face the tourists and in good integrity to develop the enterprise. All our staff will be dedicated to finish your commission every time! Please supervise from the visitors. Western Hunan (Zhangjiajie) China international travel agency travel website [www.china-zjj.cn] is currently the top ten tourism website of page view and reception amount in Zhangjiajie. It is a leading travel advisory platform in Zhangjiajie area which adopts the mode of "website + telephone service center + travel agency operation" and relies on the advanced e-commerce travel website. We provide non-face-to�Cface travel service under the foundation of unified backstage database (special data of tourism products). Ground website service center in Zhangjiajie travel agencies provide and custom tourism products for customers through the unified product data and customer management data. And it will track customers’ consumption patterns through advanced customer relationship management system to provide personalized tourism value-added service for the target customers. At the same time, the customer service center can confirm with customers at the first time through online consulting, telephone, mobile phone, e-mail, QQ and other network instant messengers and so on. Customer service center works for 24 hours a day to provide the convenient which the traditional travel agencies can not provide for customers. Group tour: including the classical trip lines in Zhangjiajie and Fenghuang and Hunan. Clear itinerary and reliable quality. Self-service tour: You can individually order a product or arbitrarily coordinate the products. Tourism customized service: For your personalized needs, we can custom personalized travel products for you. Exhibition: The exhibition reception center of international travel agency is dedicated to serving the high-level professional business travel, incentive travel, conferences, exhibitions, performances, festivals, culture and sports business and so on. Business travel service: With the management scheme of excellent service and the formal travel on business to meet the customers’ needs. Self driving tour: Professional self driving tour guide and self driving tour line. We will develop into a flagship tourism enterprise in the field of Zhangjiajei Hunan area tourism industry. We will develop into a flagship tourism enterprise in the field of Zhangjiajei Hunan area tourism industry. CITS spirit: Faith-based, service-oriented, hard dedication, the first fight forever! Quality: We have focused on the high-quality travel service in Zhangjiajie and Fenghuang for 10 years. We are only-play and no-shopping group service! Convenience: Clicking the mouse or making a phone call, you can travel right away. Professional call center and senior travel consultant can provide the most convenient and considerate service for you! Preference:Our company can reduce costs by purchasing in bulk of the hotel, ticket and travel car. As low as some people can not believe! Profession: Professional and considerate call center and travel consultant make the consultation and reservation more convenient! Reassurance: After-sale service and full guarantee. We will make a return visit after your trip. The problems you meet in your trip, we will protect your right to the end! 1. We mainly deal with all kinds of the toursm services of Zhangjiajie, Tianmenshan Mountain, the Grand Canyon Glass Bridge, Phoenix Town, Mengdong River, Changsha, Shaoshan, Heng Mountain, Yueyang and other scenic spots. 2. To undertake all kinds of large-scale tourism team travel, training and business meetings investigation. 3. We can book rooms, tickets at low discount and arrange the tour guide with the national certificate and other business arrangements. 5. Providing online registration, online booking. online information publishing, advertising campaign service and other services.